Just bought a 2004 Cayenne S. It's steering is very heavy. 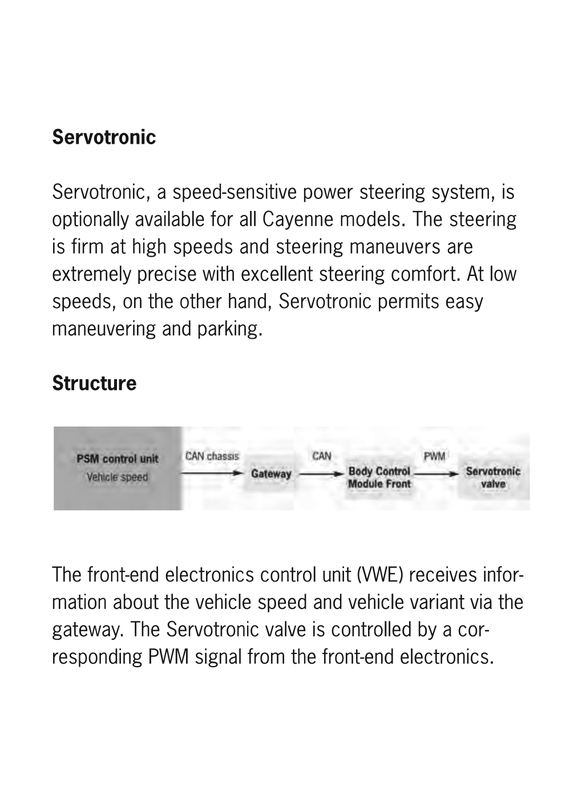 It has Servotronic. Any thoughts on what could be causing this? I have removed the relay and the steering has become slightly lighter but still not right? I drove a turbo prior to this and the steering was like melted butter! PS Demort usually checks in about 7pm and he'll probably give you the definitive answer! Yes, I know circumstances aren't great but the sooner I get it sorted the sooner I can really enjoy my lovely new motor! Private. Only 1 previous owner. The guy said it's always been like that since he bought it as he only used the car for shooting and fishing so heavy steering when parking never bothered him. Had cooling pipes done a few months prior which has saved me a job! he only used the car for shooting and fishing so heavy steering when parking never bothered him. 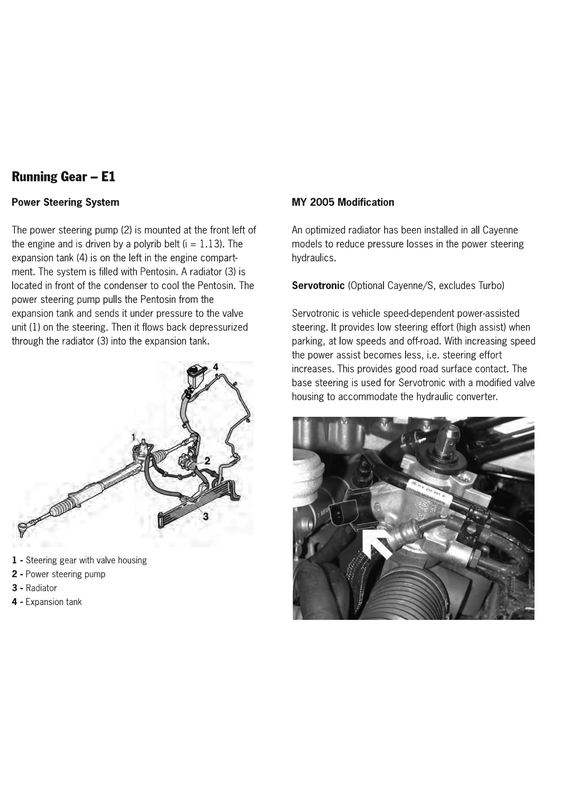 Im not a huge expert on this system im afraid as ive never really had a car with problems that i can play with , how do you think i learn ..
As far as im aware its to assist steering at low speeds .. more pressure if you like. The relay can be a problem .. ive herd of these failing but as said ive not had one to play with . There is also a fuse so i think pull out the manual and track down the fuse just to make sure thats ok .
Soo is the problem heavy steering at low speeds or just in general ? Tyre pressures at 2.6 front , 2.9 rear .. are they N rated .. ie Porsche tyres .. are they the correct size ? i see some with upto 22 inch fitted ! Is the tyre wear even ? might need a geo check adjust . I've checked the 5a fuse and that's good. Do you know of a UK stockist for the relay? It's at any speed, obviously more noticable parking and slow speeds. Just a wild stab in the dark but has the power steering fluid ever been changed and if so, did they use the correct spec fluid? Might be worth changing it anyway. Will give it a go. I want to try get it sorted myself to save labour costs. 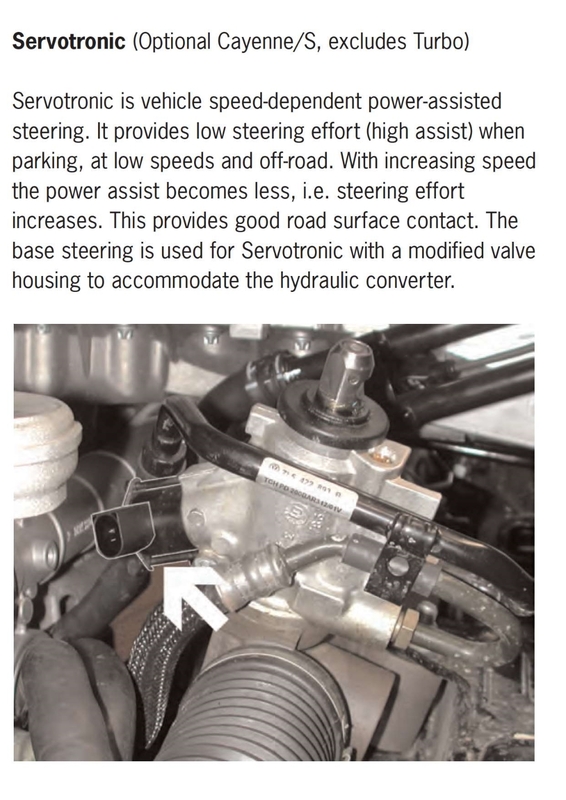 Some info on the system but basically if you have heavy steering at higher speeds then its not this system and you need a geo check / adjust first . The fluid is full, a light yellow colour - not sure what colour porsche spec fluid should be. Also noticed the steering is not centred, wheel is slightly to the left (say 11 o'clock) to drive straight. Could this cause the problem? When parking I don't hear the pump going mad so I'm guessing that's ok. The only way I can describe it is imagine driving with the brake on very lightly. It drives but you can tell something it holding it back slightly. Ok .. heavy steering but something holding it back ?? That sounds like a brake problem , heavy steering is just that .. harder to turn lock to lock .. holding back is a possible binding issue with a caliper ..
Ok .. jack the car up and make sure all the wheels are free .. you can turn them without any sticking . Back to basics and you need the geo check / adjust as if the tyres are not in the correct position you will have steering issues . relay has been replaced but there is wiring that operates it . so the next step would be to check this .. finally you have components .. steering rack basically .. could there be a fault with it . Faults like this are a case of working through the most obvious and then onto the least and most expensive items . I would prefer it though that someone like me actually drives the car and says there is an issue as this could turn out to be expensive or not actually be a fault . Steering fluid is Pentosin .. a mineral hydraulic fluid thats green .. to be fair though it can look yellow in the containor .. people tend to use ATF fluid to top this up .. it smells and looks different but ive not yet seen an issue that the wrong fluid has caused . Will make sure the wheels run freely tomorrow. Another way to explain it is like driving and turning with flat tyres. Do you think I'm better off taking the car to a Porsche specialist or a generic garage that I normally use? Thank you so much for all of your time. If you were closer I'd feel much more confident bringing it to you! Bless you but we are far appart from each other . Ok you have just added another comment that makes me think geo .. turning with flat tyres .. more surface contact .. incorrect geo .. tyres sitting wrong and possibly increaseing resistance .. wether thats tracking camber or castor and on a Cayenne all are adjustable where as on sports cars castor is not . Mechanical basics .. so geo first to make sure the mechanical bits are correct then move onto electrical systems that is low speed assistance .. and if you have this fault at higher speeds then its not electrical . In theory Halfords could do a geo .. so fairly cheap .. i would check the castor has been adjusted .. or you can just post the printout here . Not sure generic .. you want a garage with Hunter or similar system . so .. i would suggest a geo .. if no better then a Porsche specialist and see what they think as we drive these every day and will soon know if there is an actual fault . BTW .. the tyres are all the same make and size ? all have similar wear patterens and they are 19/ 20 inch not 22 ?